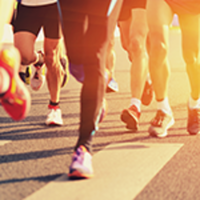 Run wild at the nation's oldest zoo on April 20, 2019 at the 5th Annual Philly Rabbit Run 5k race/1m walk at the Philadelphia Zoo to benefit Parkinson's Disease and to kick off PD Awareness Month in April. Make tracks to the zoo and join Shake It Off, Inc. for their 5th Annual Philly Rabbit Run 5k run/1m walk. Participants will enjoy an extraordinary opportunity to run inside the nation's oldest zoo’s 42 acres of lush gardens with more than 1200 rare/endangered animals before it is open to the public. For the serious runner, this is a USATF certified course and is chip-timed race, but also a great time for the leisurely walker. Gates open at 6:30 am with the race starting at 7:45 am. Your fee includes: free t-shirt*, rabbit ears*, admission to the zoo for the whole day and an awesome post event celebration with Philly's Today's 96.5FM, live music, food, drinks, vendors, special appearances by the NFL's Philadelphia Eagles Cheerleaders along with the big bunny, and more! Net proceeds benefit Parkinson's research including Michael J. Fox Foundation. Every-bunny is welcomed, whether you hop, run or walk the 5k or 1m. All ages welcomed. Strollers are allowed. Children under 2 are free and children 2 to 10 years have a discounted rate. Friends and family who want to cheer you on can buy a Spectator tickets on the day of the race. This also gives access to the zoo for the entire day! Become a Rabbit Ambassador! Gather every-bunny together and form a team. Fun-raise! If you raise more than $250, your registration is refunded. Also, a prize is awarded to the top fundraiser. Due to the popularity of the Philly Rabbit Run, early sign-up for this wildly-awesome event is recommended. Space is limited and is expected to sell out. However, if space allows there will be walk up registration the day of the race beginning at 7 am for $47.00. Parking is available in the zoo garage for an additional fee. This is a rain or shine event. Shake It Off reserves the right to cancel due to severe weather or dangerous, unforeseen race conditions. There are no refunds. To receive medals, participants must be present at the post event party as we are unable to mail the items.